The award-winning animation directed by Damian Nenow and Raul de la Fuente will premiere today at the Polish cinemas. Take a minute and read our interview with the filmmakers. Stanisław Liguziński: Could you both tell me how you became interested in Ryszard Kapuściński? How did you come across his books? Raúl de la Fuente: I have been a great admirer of Kapuściński's literature since I was a teenager and it deepened when I studied audiovisual communication at University. He inspired me to fall in love with Africa and Latin America, encouraging me to travel the world with a camera as a documentary filmmaker. Whenever I wasn't reading another book, I would re-read Kapuściński. I was fascinated by his way of understanding the world and the Other. Knowing Africa as I do, when reading his books I felt like I was watching a movie. Damian Nenow: As a typical Pole, I encountered Kapuściński as early as at school – primary or secondary, when you read “The Shadow of the Sun”. Like most of us, I swallowed Kapuściński together with such a large dose of school readings that there wasn‘t much left in my head after it. I remember the poetic, epic descriptions that stimulated my imagination, like the wooden town abandoned by the Portuguese, but not much more. So that first contact is not so important. What matters more is when we started working on the film in 2009. It was then that I discovered, under the poetic form, a lot of up-to-date things related to what had happened right on my doorstep and his words became very powerful. We all have writers we admire, but don’t necessarily end up turning their books into films. What triggered you to make this project? DN: On one hand, the importance of the topic was crucial in the context of contemporariness. On the other hand, as a creator of animation films, I was fascinated with the poetic part of his works, his creativity. I always search for topics that allow me to present surrealist visions by playing with space and world. I love turning it upside down, showing things through a prism. “Another Day of Life” brought me a potentially epic, spectacular and important topic. RF: One day, I was talking with my producer Maia Ramirez and we concluded that someone should make a movie about Kapuściński and if someone was going to, it might as well be us. Another Day of Life was not only his favourite book, but also mine. The story unfolds across a three month period and follows the logic of a countdown. It’s a very cinematic Cold War tale with incredible characters. Therefore, we went straight to Alicja Kapuścińska and got her approval, after which we met with Platige Image and Damian. Not much later, we were already on a plane to Angola to follow the same path taken by Kapuściński 40 years earlier. DN: This book is important not only because it is a treasure itself, but because in the book Kapuściński used a formula for the first time he would then utilize in his future work. He tells a story about the events in Angola, when something occured that made Kapuściński stop writing dispatches and started creating his characteristic style. Some people even claim that it was his first real book. Before Angola he was a reporter and after he became a writer, soon to be one of the most outstanding writers of our century. He was called a translator of cultures and did not divide the world into east and west, but rather into a rich north and a poor south. He looked at the world from the perspective of a man, he investigated, understood and trusted people. And then he wrote about the happenings from the perspective of a man. This formula of perceiving the world is particularly important now, when we prefer to count the stacks of life jackets on the beaches, looking at refugees squeezed in the boats from a distance. This is the essence, a recipe one can adjust to the contemporary world. Would you call your film an adaptation? DN: I would rather avoid this term. From the very beginning we knew we were doing a film about Kapuściński, about when he became ready to write a book that would transform him from a reporter to a writer. We never planned it to be an illustration of the book itself, so we didn’t feel obliged to mirror everything and translate it into the language of film. RF: The trip we made to Angola with Maia in 2011 contributed enormously to the final draft of the script. We met the characters featured in Kapuściński’s books: General Farrusco, Artur Queiroz, Carlota's sister. We asked not only about him but also how their lives unravelled. Kapuściński wrote an epilogue to his books years later where he asked what happened to all these people. We made the book the soul of the film, but also wanted to finish the story. DN: Partially, we filter the content of the book through ourselves, what we know about Kapuściński, his poetic descriptions and reflections. The result comes from us and harmonizes with the language of animation that is a pure creation itself. We were not afraid of it at all. RF: I contacted Platige Image after watching Damian's previous film – “The Paths of Hate“. For me that was a revelation, his visual style matched perfectly what I imagined would be the best way to tell that story. DN: Our animations are impressionist, more abstract. They are focused on emotions and not commenting or adding facts that did not happen. We knew that this contrast would work in favour of this hybrid connection. Thanks to a formal key, we could let our imagination run riot in the animation part and we were not afraid that we might distort something. Were the people described by Kapuściński aware of the book? Did they read it? DN: Obviously, they did. All of the interested parties know about this book. The archives in Angola are in shreds. The war ended relatively recently, everything is ruined and therefore there is no written chronicle of the history of this place. “Another Day of Life” is one of the most valuable sources of knowledge about those times. Given that there are no archives, this book has a historic value. RF: They remember Ricardo, which is how they used to call him, really well and claim that this book is an honest reflection of those times. You could tell they had a very close relationship with him, since they were able to quote in details particular experiences and specific moments they lived through together on the frontlines. We realized he had to be a really empathetic guy, because it's not easy to be remembered by this kind of people. They were at war, fighting, and he was just a foreign correspondent. We organized a special screening of the film in Lisbon for our main characters - the real ones. There was Artur, Luis Alberto and Farrusco who flew from Angola to join us. We adapted their lives and memories into a hallucinatory film that mixes facts, fiction, adventure and imagination, so I was incredibly nervous. In the end they all had tears in their eyes. 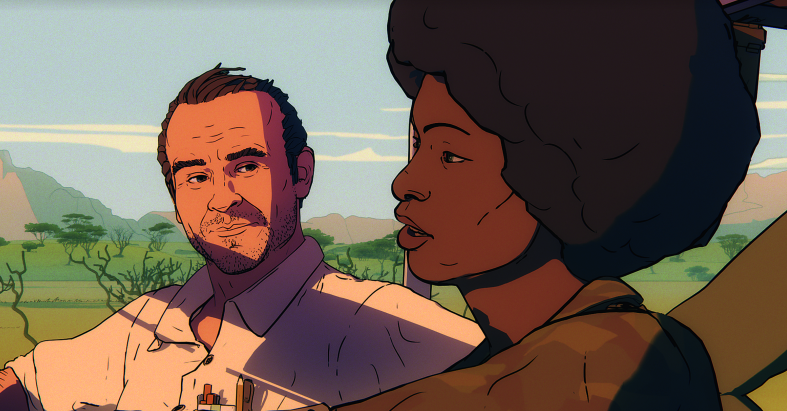 They recognized it as an autonomous piece of art, but also a good, poetic portrait of brave Angola and reflection of their lives and Kapuściński's experiences there. We also got approval from Kapuściński's wife and daughter. You said one of the source materials is the book itself, but you were working in animation and had to create everything, every single object in the scene. What other references did you have? RF: Live-action footage and photos I shot in Angola in 2011 were our primary source of inspiration for developing the film, characters, designing props and locations. I also visited Lisbon, Warsaw, Barcelona and Havana to meet all the other people Kapuściński met in the book. DN: We based our work on the documents gathered on-site, but today you can just use Google Maps to visit Angola. The picture on the screen doesn’t show emotions, the heat, the temperaturę, the smell of sweat and other important things, but is was enough to work on the visual part of the film. Just like with any other film language, animation demands inspiration, reference. It is then followed by long months of designing, sketching and then building created worlds by means of computer graphics. We also had the archive footage which is also shown in the film in its original form. These were the recordings of Luis Alberto, a Portuguese man who conducted interviews in 1975 in Angola together with a TV crew and then returned to his country with the materials. They were deposited in an archive in Lisbon and you can still watch them today in good quality. RF: Luis Alberto's materials were wonderful. It was a very magical moment to pick up those reels after 40 years together with him. Thanks to them we discovered the real Carlota and we realized that it's crucial to include her real-life images in the film. She was a key inspiration for both Kapuściński and us and we fulfilled the request she makes of him in the movie when she asks: make sure they won't forget us. It's the condensed message of the book. We all want that another day of life and some of these fighters whom Kapuściński met on the front lines, struggling for survival, asked him to take photos of them, to see them for who they were while they were still alive. How about the visual style itself? Was it inspired by the works of other artists or was it a result of freestyle designing? DN: It was totally freestyle, almost completely, and the only limit was our budget. Unfortunately, letting your imagination run wild is very expensive, so we had to simplify and reduce some of the visionary scenes. In terms of my inspirations, it is a complete mix of everything I have seen in my life, starting with “The Neverending Story“, which was the most important film of my childhood, up to all kind of space operas whose visual power has always fascinated me. I’m interested in spectacular transformations of the world, the situations when it falls into pieces. The line comes from something I created for “Paths of Hate“ when I was inspired by comic book illustrations. Raul, it was your first hands-on experience of working on an animated film. How did it feel to delegate so much work to other artists and not see results straight away like in a run-and-gun documentary shoot? RF: It was a big challenge, since I had no experience in animation before and we were mixing it with live action. However, as Kapuściński said – the sense of life lies in crossing borders and we were trying to create a new language with Damian, a narrative approach that would fit our topic. It was difficult and involved a lot of waiting for the artists to create sequences, but we'd be busy regardless of that i.e. creating timelines with only sketches, concepts, storyboards and photos. Nevertheless, I was also pleasantly surprised that a production like that could still allow so much flexibility. I was convinced that in animation, once the production starts, nothing can be changed, but we kept introducing new ideas until the very end, since we all had a common goal - to make the best movie possible. Anyway, all that waiting is definitely a big challenge for a filmmaker, but it was a 10-year-long torture that led to a result that I'm proud of. What was the division of labour between you two as co-directors? Did Raul take care of documentary footage and Damian overlooked the animation? RF: We directed every aspect of the film together - 50/50. I came up with the idea, and I'm the main writer, Damian solved some technical issues that I wasn't involved in, but we made all the crucial decisions together. In our view there was no division between animation and documentary. We wanted the movie to be a whole and feel like a song that you could follow with your eyes closed without noticing the transitions between animation and live-action. One example of that flow is the way we introduce the live-action interviews through simple cuts between animated characters and their real-life counterparts. One of the most memorable things in your film is the use of the term confusão that already made quite a career for itself finding its way to every single review of “Another Day of Life“ I read. RF: Confusão was the original title we chose for the film. For us, it was the key to that story from the very beginning. RF: It’s a lack of orientation, position in which you can’t do anything to solve the situation. I experienced that very often during my travels, also in Luanda (Angola) in 2011. RF: You can see it in the refugee situation, in the way people are dying in crazy wars in Syria or Sudan. Confusão is the new emperor of the world now. DN: Kapuściński comes to the conclusion that confusão can’t be investigated, you can’t win with it. There is no path to the final truth. Until his trip to Angola he tries to get to the heart of darkness, to understand the war that is his demon. After Angola, he knows that you can’t understand war, because it is ruled by confusão and this is the key change in his way of thinking. The events described in “Another Day of Life” change him, they shape a writer who turns his gaze from Che Guevara and other freedom fighters to the world of ordinary people. In more general terms, every one of us is in the state of confusão with the whole media buzz and fake news. We don't know anymore how to anchor our knowledge. RF: Yes, that’s why I’m always looking for new references among journalists, war reporters and writers. Those who follow Kapuściński and look people in the eye, give voices to the poorest. As Kapuścinski wrote: the poor used to be silent, the poor don't cry, the poor don't shout, they have no opinions, they are silenced. For Kapuściński, those correspondents whose writing I follow and me as a filmmaker, giving a voice to people who have nothing is crucial. That’s the way I've been making my short films in Africa and elsewhere so far, that's why I went back to Sierra Leone to show jails that imprison kids and 13-year-old minors forced to prostitute themselves or follow boy soldiers in Colombia. I want to tell stories of people who have no voice in the world. I'm more passionate for this work than ever and I feel that by going to the refugee camp in Rwanda next autumn I somehow continue the legacy of Kapuściński and I'm happy we can share his story with the whole world with “Another Day of Life“. “After City of Ruins“, “Paths of Hate“ and “Another Day of Life“ one has to wonder if you're also obsessed with the topic of war, Damian? DN: I’m not fascinated by war itself, but as an animation topic it gives you a chance to show the second nature of man, the beast that is deep inside us. War exposes, degrades, provokes to desintegration, a reduction to our animal part which is a great nourishment for the surrealist animation I create. There's an ongoing debate in Poland pertaining to literary reportage and the extent to which you can alter the facts to convey the meaning of the situation. Kapuściński also fell under the scrutiny in that discussion. Who was more important for you - Kapuściński as a real-life person, spending boring hours behind the desk, agonizing over each sentence or his bigger-than-life literary persona - Ricardo captured on the pages of his books? RF: I wanted to cover both and include those silent moment of reflection, but it would require us to produce a series rather than a film - which, by the way, we still dream of making. Moving forward with our hybrid film, mixing very expensive animation and documentary, we were limited by duration and ended up with less than 90 minutes while not being able to cover all the angles. At the same time, the real-life characters I met were incredibly similar to the ones that Kapuściński described in his books. I know the controversies that Artur Domosławski's biography of Kapuściński raised and I tried to verify some of its claims. For example, I asked Farrusco, Luis and Artur if Kapuściński ever carried a gun and they all said no. And these people were there with him after all. Also, Luis Alberto Ferreira's account of meeting Carlota perfectly matches what Kapuściński wrote in his book. From my personal and professional point of view, judging from what I was able to check - all the stories are real and exact. The more I learned about Kapuściński, the more he grew in my eyes - a relatively unknown Polish reporter who ended up making such an impact and being remembered by all these people many years later. Certianly, he took part in that conflict not only as a war reporter but also an activist i.e. working as a translator for MPLA (People's Movement for the Liberation of Angola). He believed that journalists should be engaged, should help change the world. He became involved with all these people and believed they deserved his help. He chose to not only be a journalist in this conflict but also a human being. Therefore, I'm in love with both - the literary character and the real man, but it seems to me they were very similar, and we were really lucky to have had that real guy. DN: I think that we show this complex mechanism of transformation in our film. Ricardo crosses many limits here, compromises himself professionally, in life-related matters, politically and artistically, but at the same time revises his views and evolves. The fact that in a certain moment he chooses one side is in accordance with his nature. He needs immersion, he has to plunge into this world completely, get to know people, spend time with them, instead of watching them from the side. There is a scene in the film, in which Farrusco shows Kapuściński an old woman who has baked bread for both feuding sides. When the reporter asks her how it was possible, she answers that one can’t fill a stomach with a cause and she didn’t work for a cause, but for life. Kapuściński observes particular people, and there in no possibility of symmetry or objectivism from such a position, especially when you are a reporter from behind the Iron Curtain, when a side is somehow ascribed to whereever your passport is issued. It causes dilemmas and professional conflicts and therefore Kapuściński would never return to writing dispatches. He wrote books. As a teenager, I was inspired by another reporter - Hunter S. Thompson - and later on I realized that it was largely due to the legend created by narratives based on his persona, not his original writings. Nevertheless, I feel that “Another Day of Life“ might have that power to transform Kapuściński into a pop-culture icon. It could inspire people to turn to his books as well. RF: I hope so. It was our idea to introduce Kapuściński to a much larger audience. If they fall in love with the film, they might revisit his books as well. I personally feel a painful absence in my life since Kapuściński passed away. He inspired me to try to understand the world. Whenever I had a topic that I wanted to know more about, I'd always read Kapuściński. Now he's not among us anymore, and the world is being taken over by confusão. We need more references like him to understand the world around us nowadays.